This exhibition came to be because the panel reviewing artists’ submissions last May (consisting of Matthew Offenbacher, Gail Gibson, Susie Lee and myself) was particularly taken with Night Lady by Jean Burnett, a Puyallup artist none of us had heard of before. 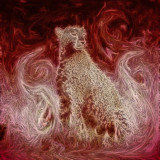 Night Lady is a manipulated photograph of a majestic cheetah drawn in smoke or magic, emerging from dramatic fiery swirls. Matt suggested that I curate an “animals” show around this piece, which we all emphatically agreed was a great idea. With Night Lady at the helm, the Animals show took shape naturally, with artists from different backgrounds, unique reasons for making the work they do, and different audiences for their work. The nine artists in Animals explore our human relationships to animals in a variety of ways that make us consider how we use and portray our fellow creatures. Gina Coffman collected dried slugs when she was eleven in 1988 and then they sat in her parents’ Bellingham house for over twenty years until she photographed them in 2012. Joseph Flood’s dinosaur chariot is driven by an ancient Egyptian. Sean Gallagher works with materials and traditions passed down to him from his family–ancient inhabitants of the arctic–to create dance masks such as Walrus Dance Mask, in which “reverence for the animal is intrinsically understood, expressed through dance.” Thorly James’s otters peek out of the wall as though popping up to play. Ada McAllister uses light-handed watercolor brushwork to capture beloved pets in portraits. Stacey Neumiller paints iconic goats that preside over idyllic farmland. Brenda Scallon’s Always a Cockatoo in a Parakeet Cage was done in response to a story by Rosebud Ben Oni. Tim Suchsland’s panda bears, elephants, and tigers eating human limbs float via collage on an abstract expressionist backdrop.